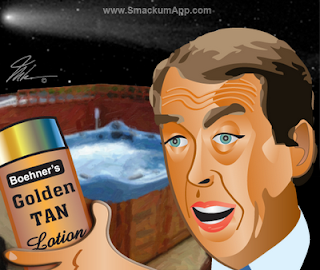 House Minority Leader John Boehner (OH) is a hopeful man. He hopes that voters are both stupid and forgetful. He hopes they have no recollection whatsoever of the eight years of largely Republican rule during the Bush years; years that saw a loss of eight million jobs and the failed policies that led to the worst financial meltdown in America's history since the Great Depression over eighty years ago. And he's banking on this memory loss to propel his elitist, do-nothing party back into power in the November midterms. Boehner's GOP needs to have a net pick up of 39 seats to oust his political nemesis, Speaker Nancy Pelosi (CA), and re-take control of the House. Boehner, the future-Speaker wannabe, challenged President Obama Tuesday to fire his economic team over what he called a failure to turn the economy around. "We do not have the luxury of waiting months for the president to pick scapegoats for his failing stimulus policies." Boehner's disingenuous assertions ignore reality, and the huge economic improvements Obama's made since taking office. A new Congressional Budget Office report cited the president's stimulus package as having lowered the unemployment rate in the second quarter of the year; creating 1.4 million to 3.3 million jobs; and increasing productivity by approximately 4.5%. Boehner needs to remember where the economy was in January of 2009 as George W. Bush was preparing to exit the White House. The nation's output was contracting at an annual 6% rate, jobs were being lost at a 700,000 monthly clip, and American industry--from automobiles to banking to Wall Street to retail and housing--was on the precipice of disaster. While we still have a long way to go towards full employment and financial prosperity, America's economy has made monumental progress and is clearly headed in the right direction. In response to Boehner's revisionist history, vice president Joe Biden came out swinging: "For eight years before we arrived, Mr. Boehner and his party ran this economy and the middle class into the ground. They took the $237 billion surplus they inherited from the Clinton administration and left us with a $1.3 trillion deficit, and, in the process, quadrupled the national debt — all before we had turned on the lights in the West Wing. While acknowledging the GOP's Bush-era complicity in Congress's profligate spending, Boehner boasted of Republicans' near-unified opposition to Obama's stimulus bill, health care reform and environmental legislation. "We began to show people we are different." No, the only thing you're showing people is that your #1 goal as a party is to screw the poor and middle class while obsessively pursuing massive tax cuts for the rich. Sorry, Johnny, but you're singin' the same old Republican tune. The billion-dollar question is, will voters realize that come November....and remember why they kicked you and your useless party out of power in the first place. The GOP has a California problem. Time and again the California GOP nominated far right crazies in the primaries only to lose in the generals. When the put up moderates, they won. The Tea Party tide from Florida to Alaska is the same thing, firebrands getting the wackos emotional, then alienating the moderates come election time. Boehner is counting his salmonella-laden eggs too early. I don't say the following lightly: why does John Boehner remind me of Hermann Goering?